This spectacular Ladies Guess Prism watch has a stainless steel case and fitted with a quality quartz movement. This stylish time piece is set with 2 rows of sparkling crystal stones around the bezel, has a stunning silver dial, numeral hour markers and features day & date dials. It fastens with a stainless steel bracelet. Bought a guess watch for my wifes birthday arrived two days after my order which I thought was great service.The watch is good quality and the wife loves it.The watch was also cheeper than other retailers .With the level of service received i would recommend the watch shop to anyone. Just got this watch as a replacement. Really love the look of it and the date and time configurations. Only thing I would say is that when closed/locked the clasp sticks up a little so could do with an extra lock on the other side to hold the clasp down not sure if that makes sense. Regardless of this the watch is chunky, stylish and a pleasure to wear! This is a gorgeous watch. 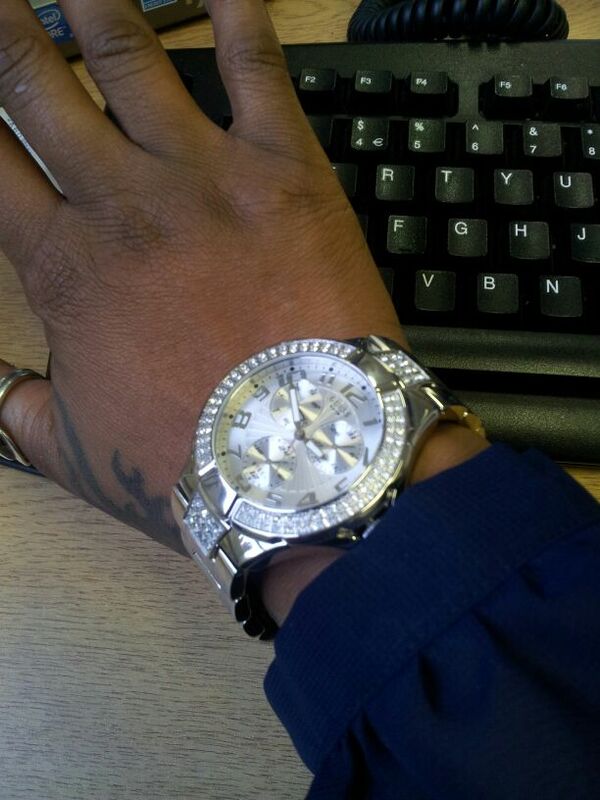 Just enough bling and even though its the bigger watch it looks well on the wrist. Arrived in good time. Wanted a new watch. Looked at nearly all of them on here. But the guess watch kept jumping out at me. I then thought It must be the one. So I clicked buy. Put in what I thought would be my wrist size. the watch came very quickly. I was a little dispointed as it came in a guess little drawstring bag I was expecting a chunky box. Anyhow took the watch out and it was fantastic not to blingy just right. I did have to adjust time and date etc. Wasnt heavy on the wrist its a nice comfortable fit. My daughter chose this watch and when it arrived she loved it. The stones are very sparkly and the links were easy to have removed. Great service both in sales, delivery and in customer service when sorting out a problem. Perfect Gues Watch for a Special person any time any day anywhere! Silver with sparkle Diamond look.Pretty Pretty Cool! Fantastic watch looks stunning very happy with purchase. Great value for money looks very expensive. Excellent product!I love it!I like the stones and the way it makes my hand look!you can wear with elegant clothes but with sports also it can be a perfect Christmas gift! The Guess Watch is really great it has a really nice face and a very good stainless steel bracelet strap with a very clever clasp so you could put the watch on in a matter of seconds, very easy to set time and date, i didnt even have to look at the manual to set it up. Really happy with my new guess watch. Love the bling and the whole look of the watch. Comfortable and easy to open and close the clasp. Can wear every day or on a special occasion. Havent figured out yet how to change the date on the separate dial but im sure if I read the leaflet I will. The arrows on the links in the bracelet tells you which links can be removed. Brilliant ! Watch arrived VERY quickly it was exactly what we wanted. Sometimes viewing something online it looks very different in real life but on this occasion we are so pleased with everything, colour, style just what we wanted. Beautiful watch , my wife loved it . Elegant design and felt like a quality watch . She loved the bling and style of the watch. Bought this watch as a mothersbday and birthday treat, its fab, sparkly, really nice big face and easy to read dial, I love it. Lovely watch, very smart.You can wear this watch with anything. Nicest one Ive bought yet. I purchased this watch for myvpartner for her birthday and itcis a lot nicer than the picuters. Great watch looks beautiful well made and my partner was over the moon. I am delighted with my watch. This is a present from my husband for Xmas and I cannot wait to show it off. The clock face is very eye catching surrounded by sparkle and the bracelet is fabulous. The watc is very nice bought as a birthday present for myself. It was huge though and had to take it to get some links of so it could fit better. Nice and fashionable , lovely colour brought the silver looking one. Amazing watch for price. Looks a lot better in reality. Very well made. Friends and family love it. So do i.
I would recommend this watch to anyone looking for a very good watch but also someone who wanted a modern timepiece. This watch arrived the day my Nanna died. Will cherish it forever. Beautiful watch, nice size, nice weight. Very girly. Watch resizing service is awesome. Very happy with my purchase. Absolutely love it. Even nicer than the photo. Exactly as described and what i wanted. Love the watch!!! It has a nice shiney round face, once i figured what the other dials were my failing Im blonde I loved it even more. It is slightly heavier than my other guess watch but not enough to put me off it. It is classy and I wear it all the time, to work and play. Have worn Guess watches for years and love them but think this is the best one yet. If you are looking go on get it you wont be dissapointed!! The watch is really good and the delivery time on perfect time.Would like to come back again. Absolutely love this watch! Having always gone with white leather watches I decided to go for something different, that being a metal bracelet watch and am I glad I went for this one! Extremely flattering watch with the diamonte features around the face of the watch. It also has a very good weight to it which in my eyes means you are getting what you paid for. The watch face includes the date dials which is very handy for work! I Have recieved many comments on how nice the watch is. The metal itself is a shiny metal and not a dull or brushed metal so it stands out even more. I would definitely recommend this watch and in my opinion is just as nice as the Michael Kors watches but for half the price! 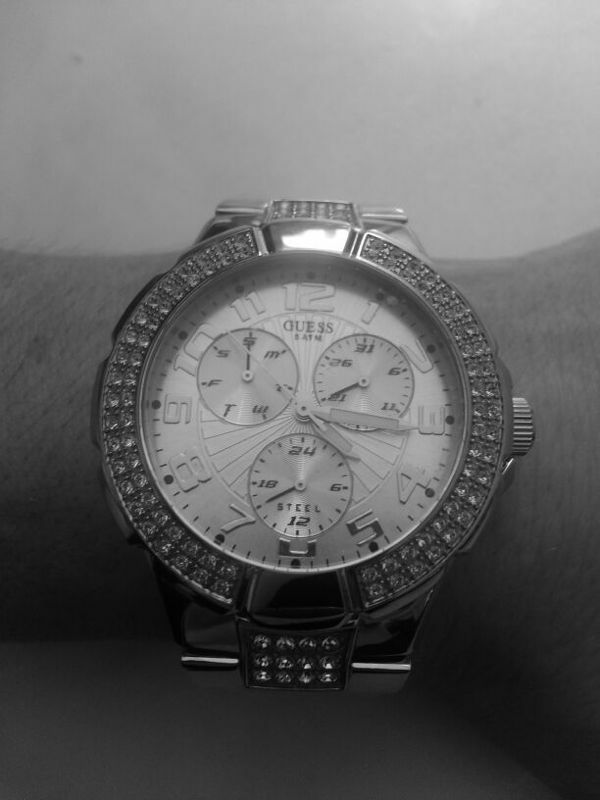 My watch is perfect like the diamonds and silver colour, my friends love it. I like the fact that it is bold and stands out. Bought this for my gf as it looked gleaming in the pic! The delivery and packaging was very impressive! Took the watch out the box but it didnt look as sparkly as in the pictures on their website, however silly me didnt realize it has a tight plastic wrap on it to protect it...once removed the watch looked even better that the pics! Well worth it. I really really LOVE this watch!! The watch is modern with a big face but still feminine enough to look really pretty on your wrist. The diamanté detail around the face gives it just enough bling to be eye catching but certainly not tacky. In terms of fit I had to remove about 4 links but I have tiny wrists, and the links were easy enough removed. All in all I would 100% recommend this watch! Have 2 of these watches myself white and gold my daughter liked them very much she liked the chunky look of them also the detailing of the watch looks awesome lots of comments by people. great looking watch stood out from the other in the collection.Silver bracelet and dials nothing negative about it to be honest. Bought as a birthday present and wife loved it. Have bought this as a Christmas present for my daughter. I am sure she will be delighted! 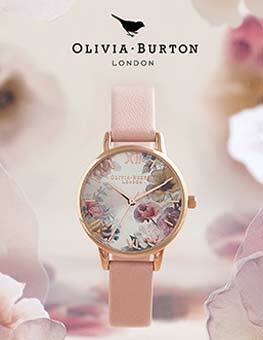 It certainly catches the eye and as well as a functional watch it is glamourous enough to be a fashion accessory. Omg, its absolutley gorgeous, My hubby bought me this watch for xmas, and I cant wait to wear and show it off. Watchstop is fantastic, website is easy to use, and the customer service is amazing, kept me up to date throught the purchase, and delivered next say as promised. I will def be using them again. Great watch, although a Unisex watch it really does suit a male. Quick service and smooth transaction, very pleased. This is a lovely looking watch.I like the fact its not to sparkly,just about right.The only thing I didnt like was the lock on it- feels a little bit weak and looks quite thin.But the face of this watch is quite large and drows attention. just received the item, great. 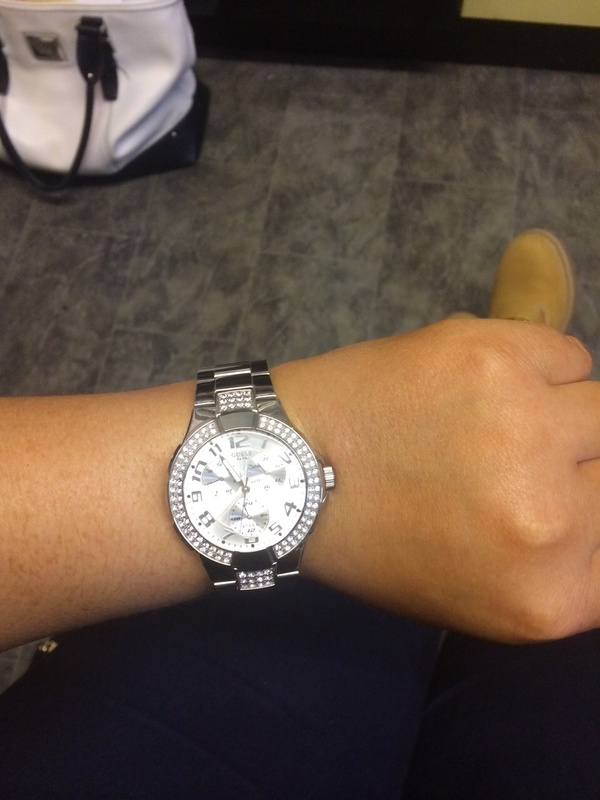 bought for my girlfriend, she will be pleased and over the moon for sure, its so nice watch.only problem is I need to sort out the resizing of it, well thats not a problem to me. Absolutely beautiful watch and arrived very quickly. One very happy birthday girl!! Product is as good as pictured on the website. Very happy with it and so is the lovely lady who received it, so two ticks. Quick delivery, was a last minute purchase before xmas and was relieved to have the package arrive promptly. I LOVE this watch!!! I was worried it would be a bit over the top but its not at all. It can be worn for all occasions, and just looks amazing. Well worth the money and i love the cute bag it comes in :) very happy with my purchase. Delivery and return service from watch shop excellent 10 out of 10. Would strongly recommend to anyone.. Very good quality product. Very good description of product colour and design. Would reccommend the watch shop to anyone. this watch is value for money and looks very expensive when on display. Its very well made with out looking too heavy and chunky.This watch looks so differant on when worn.Great choice and highly recommended. Excellent, fashionable, nice watch. Quick and save delivery. Very Happy.b Great present for the love one. Would recommend everyone. Good Luck!!! I Bought this watch for my wife as a gift for Mothers Day and to say she was pleased with it is an understatement. The watch is stunning in every way. I highly recommend this watch and the service you get from The Watch Shop 100%. I am very happy with the purchase. it looks 100 times better on and I am so happy i chose this model. Very impressed with guess watch i previously ordered which was a guess silver bracelet watch with diamantés encrusted around the face. I was very impressed with the free delivery and how quick it was delivered. 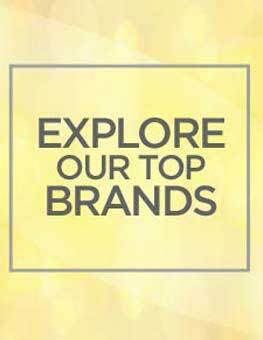 Overall very satisfied and would definitely buy off this website again. I bought the watch for myself, as a treat, and what a treat!!! I love it. It shimmers in the light and is eye-catching without being garish. As my niece stated (and I also got her the same watch for her birthday, which she loves), "it has enough bling to make it look the business". Well worth the money. And I was also very pleased with the service from Watch Shop, very quick and efficient. Fab watch love it! Knew it was big when I ordered it as seen a friends, takes a bit of getting used to but I would recommend this to anyone who likes chunky things! 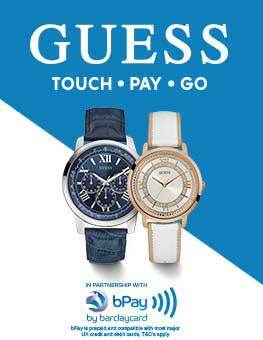 I saw a friends Police watch which I initially thought was big and even though this GUESS watch is bigger I wouldn't swap it!! LOVE, LOVE, LOVE it!!! 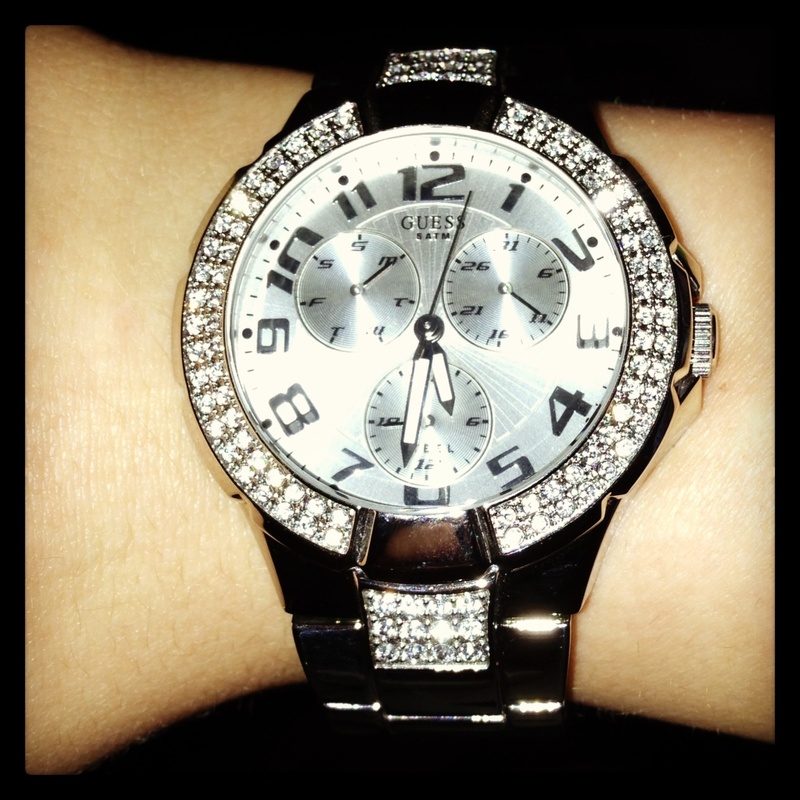 I really like my new Guess watch, I bought it as a treat to myself and I am so glad I did!!! I like it because it is a good size and is very clear to read. Furthermore, people always notice the watch when im wearing it which is a sure sign that it is a nice, eye-cathing item! I recently bought this watch and I am so happy!I looked through lots of them but as soon as I noticed this, read the good reviews as well.....I just had to buy it!Its lovely, I am really happy with the purchase.I did buy it before 4pm and the next day at 1pm it arrived so I'm really pleased about this.I dind't want to give such a good review though as I won't be happy with lots of people buying it, sorry!! !But its an amazing watch, they can also adjust it for you for free, which was just brilliant!I did had a bit of trouble with fixing the time and all that, even though it was mainly my fault as I didn't read the instructions carefully.Good purchase and it does look amazing in reality as well!!!! I was looking for an every day watch which also made a statement. 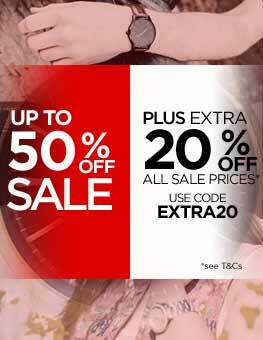 I like Guess and have bought their clothes and accessories and now the watch. Was unsure how I'd feel about seeing it 'in real life' and was afraid it would be 'bling' but the returns policy assured me. However, it's even better than the picture - really classy with some added sparkle. I LOVE it. In fact I've even thought about saying how much I don't like it so that no-one else will buy one! Unlike some other reviews though, I do not recommend it for men. The watch was good, same as on picture. Delivery wasn't as promissed. I purchased before 4 pm, but I got the item not the day after, and not even before 1 pm second day, but around 14 30. Bought this watch as a Christmas present for my girlfriend in Dec 2009. She is absolutely delighted with her watch. The quality is brilliant and the presentation box looked the part. The watch was very good value and the time keeping is great. We have had no problems at all with it. We had to have some links taken out due to my girlfriends small wrist, but this was easily done at a local jewellers. These watches are very beautiful, my girlfriend really likes them and she was pleased by this present. We just had to remove part of strip as my girfriend has a thin wrisp. the watch was very nice. it was not over the top but still sparkled as i wanted it to. it also has a good weight on it and looks good on the wrist. i personally thinks it looks better in real life than it does on the net- the picture does it no justice. overall, a really good buy at a good price. Although do remember to get links taken out when buying the watch as it cost me an extra 20 pounds to get done at another shop after receiving it. I purchased this watch for my brothers 18th Birthday present. I was quite nervous as to whether he would like it- but he LOVED it!!! 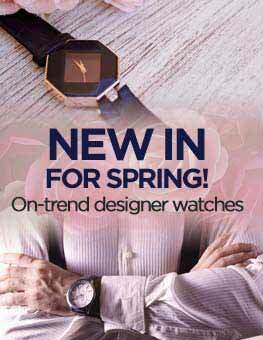 It says; 'ladies stunning fashion watch' on the description but is under the mens section and it is definately mens! It's big- but not too big, it's stylish and the crystals are beautiful! It's perfect for a going out watch and just completes the outfit! I ordered for this watch,and was amazed with the efficiency of the service especially during the two days before Christmas. The watch was beautiful as i do like my blings.A plus as got it cheaper too. Would definately order here again.Very very happy. Order 288797.Guess watch.Cant believe how quick and efficient the service was,got a discount because found the watch cheaper and WatchshopUK beat the price,got it delivered the very next day,also with the links in the strap removed for a perfect fit to my wife on her birthday.1ST class service.Thank you WatchshopUK. Startling piece (in my opinion), delivered promptly. I liked the fact that emails were sent so I could monitor the transactions progress, no worries at all!